Did you know, that insider threats have been behind the sharp increases over the past 18 months in the percentage of organizations that have experienced loss or theft of company data? According to the Ponemon Institute, three out of every four organizations (76%) have been hit over the past two years—a significant increase from the 67% of IT respondents who gave the same response in a 2014 study. The findings show that the rise is due in large part to compromises in insider accounts—a phenomenon that is only exacerbated by an increase in the proportion of employees who have unnecessary access to sensitive or confidential data. Let’s back up a little. Can you actually define what an insider threat is? Let us help, according to Google, an insider threat is a malicious threat to an organization that comes from people within the organization, such as employees, former employees, contractors or business associates, who have inside information concerning the organization’s security practices, data and computer systems. This IT buzzword has been sweeping the industry for a while now, but we’d like to breakdown really why you should be concerned, and how to better protect against insider threats. At Secure Sense, we partner with industry leaders. This includes Varonis, a security company that specializes in data protection and preventing insider threats. Why Varonis? The Varonis platform helps you identify, understand and protect unstructured data. The fidelity of metadata is higher, and they provide context about what data is most critical, most accessed, and most risky. 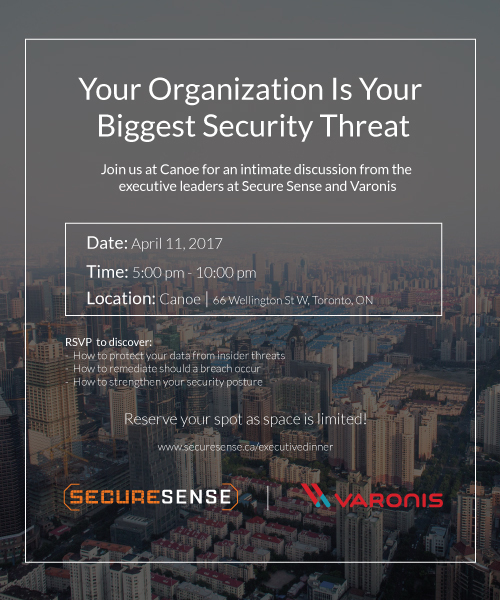 On April 11th, Secure Sense and Varonis are hosting an Executive Dinner at Canoe, Toronto to tackle the topic of insider threats and why they are your organizations biggest security concern. This open discussion forum welcomes executives from various industries including but not limited to the legal and financial sector. If you’re interested in attending, RSVP by April 5th, and a Secure Sense representative will be in contact with you.